We were driving to the spot on the Fox River near Aurora where a warm water discharge keeps the surrounding water warm during the winter. As we turn a corner in the road Pondboy pipes up "Is that ice floating down the river?". Sure enough it was ice. We donned our waders and walked to our entry point only to find three feet of 1/2" thick ice. We broke through the ice and waded across the river, while mini icebergs collided with our legs. What did we expect, it was eight degrees Fahrenheit. We started fishing the discharge drifting nightcrawlers and waxies with only a small panfish to show for our troubles. Then I cast my line into the flowing swirls of the outflow and watched my float stop in the water then disappear. I set the hook and felt a heavy pull from the end of my line. After a few minutes and a few drag pulling runs I landed my first carp ever. A few photos were taken then the fish was returned to the river that was nice enough to let me catch it in the first place. I remember you talking about this! Thats a day i will not soon forget. Me too PB. We wouldn't have had to go wading if the ice had cooperated and not melted off the ponds and lakes. Anyone is eligible. Going fishing helps ramp up the odds a bit. I saw your vid on the home page then I saw the catch of ther day. Can anyone get a cotd? Congrats on the Catch of the Day Dstar. 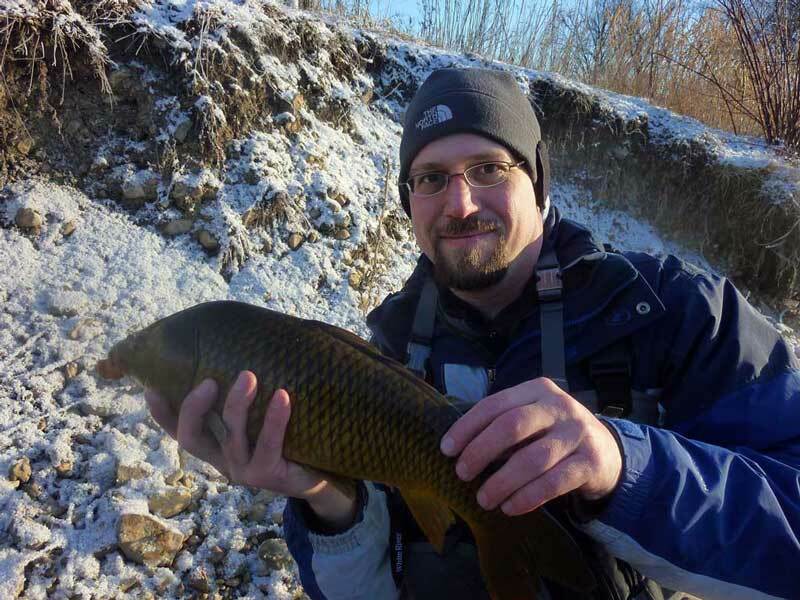 Carp are fun to catch, they fight like crazy. A buddy of mine and I used to go to the Fox in Yorkville and have a blast out there. I think you guys are nuts for wading in that weather, but I'm sure I'd be right there with you if I had some waders. Looks like crazy, freezing fun! I'm waiting for warmer, more forgiving weather before I take that leap, both figuratively and literally. Then I can ease into colder temperatures next fall. Congrats on the catch of the day and also your first carp. I have not caught one in quite a few years, but they sure are fun to fight. Great job! Nice Catch Of The Day Darkstar! Congrats on your first carp ever.